In 2018, the military plate was in place and the east wind was in the present situation.At present, from the background of the times, the fundamentals of the industry, and the trend of the market, there are factors that contribute to the performance of the military sector. The combination of these factors makes the probability of excess returns in the military sector greatly increase. Taken together, the military sector should be among the top performers in various industries this year. The background of the times: In times of trouble, calling for a strong national defense.From the perspective of the entire world, with the gradual decline of the United States, conflicts in the world system have gradually increased in the process of old and new, and the destabilizing factors are increasing. China needs to develop a strong national defense industry to protect its own security. This is the background of the rise of the entire Chinese military industry. Industry Background: The fundamentals are expected to reverse, and military growth is expected to be fulfilled by fulfilling orders.The fundamentals of the military industry are expected to continue to improve since 2018. The Nineteenth Congress proposed that our country must strive to basically realize the modernization of national defense and the military by 2035. By the middle of this century, we must build a world-class army in an all-round way, and the trend in the promotion of national defense investment should be clear. Military spending is expected to continue to exceed the increase in GDP, and equipment spending will again be substantially higher than military growth. With the deployment of personnel after the Nineteenth National Congress, the corresponding military expenditures will be gradually landed in 2018 and converted into orders for related companies. It is expected that the orders of some of the core military enterprises will have an explosive growth in 2018. Market Performance: The military industry index is looking forward to whether or not it will come to Thailand.The military industry index has lagged behind the market for a long time: In 2016 and 2017, the Shenwan Military Index rose 24th and 25th among all industries respectively, and ranked close to the bottom for two consecutive years. Under the sluggish market conditions, both industry fundamentals and institutional allocation indicators are at historically low levels: From the perspective of the valuation of the industry itself, the current market rate of the military industry is around 2.8 times, which is located in the top 15% of the industry's historical performance. Low; From the perspective of institutional configuration, at the end of 2017, the ratio of public funds to the military industry was 1.8%, which was the lowest point in the past decade.By tracing the historical performance of the industry, we can find that the military industry is a highly flexible industry. After its two consecutive years of ranking (the last five), the performance of the third year must enter the top 3 of the industry and achieve counter-attack. In 2018, with the major improvement in the fundamentals of the military industry, the military industry index is also expected to achieve a new round of counterattacks. Investment strategy: Focus on military enterprises or military-civilian integrated enterprises with core equipment advantages. It is recommended to pay attention to AVIC Aircraft (000768), China National Engineering Corporation (600038), Tianhe Defense (300397), Andavir (300719), Reiter AG (300600), and Beidouxingtong (002151). Risk Warning: Orders of related companies have not grown as expected. The background of the times: In times of trouble, calling for a strong national defense.From the perspective of the entire world, with the gradual decline of the United States, conflicts in the world system have gradually increased in the process of old and new, and the destabilizing factors are increasing. China needs to develop a strong national defense industry to protect its own security. This is the background of the rise of the entire Chinese military industry. At present, the conflict between the United States and Russia in the Middle East has intensified. As the United States conducts an air strike against Syria, it will further invest its intervention in Syria. This investment will continue to increase the risk of confrontation between the United States and Russia. With the intensification of the conflict in the Middle East, the demand for weapons and equipment from all parties concerned will increase rapidly. In the periphery of China, since 2012, there have been constant tensions in the South China Sea, the Korean Peninsula, and the Sino-Indian border. Although these tensions have finally been solved without fear, China’s powerful military strength is the fundamental guarantee for regional stability. At the same time, China must promote the One Belt One Road strategy in the turbulent international structure. It also needs to maintain a strong military strength to safeguard its legitimate rights and interests. As China continues to rise, the probability of a conflict between China and the United States is increasing. To prevent or offset the direct conflict between China and the United States, a strong national defense force is an indispensable support factor. Industry Background: The fundamentals are expected to reverse, and military growth is expected to be fulfilled by fulfilling orders.The fundamentals of the military industry are expected to continue to improve since 2018. This is mainly reflected in the following three aspects. First: Military spending will continue to grow. The Nineteenth Congress proposed that our country must strive to basically realize the modernization of national defense and the military by 2035. By the middle of this century, we must build a world-class army in an all-round way, and the trend in the promotion of national defense investment should be clear. It is expected that in the next 5-10 years, China’s military spending is expected to continue its steady growth. According to the report of the Chinese government, the military budgets for 2015, 2016, and 2017 are respectively 889 billion yuan, 954.3 billion yuan, and 102.11 billion yuan, with an average annual growth rate of 8%, which is higher than the GDP increase. Second, equipment spending will increase substantially, which is higher than the military growth rate. The modernization of the defense and defense industry cannot be separated from the modernization of weapons and equipment. As China further streamlines layoffs, the investment in the corresponding equipment field will maintain a higher growth rate. In 2017, the army layoffs 300,000 people, equivalent to a reduction of 15% of the number of soldiers. The reduction in the number of troops means that the proportion of the corresponding equipment expenses will increase, and the proportion of equipment expenditure to the total defense expenditure is expected to rise from the current 30%. About 40%. Combined with the growth of the defense budget, it is expected that the average absolute growth rate of equipment spending will reach around 20% in the next three years. Third, military spending will gradually land, and orders for related military-industrial enterprises will explode. With the deployment of personnel after the Nineteenth National Congress, the corresponding military expenditures will be gradually landed in 2018 and converted into orders for related companies. It is expected that the orders of some of the core military enterprises will have an explosive growth in 2018. Market Performance: The military industry index is looking forward to whether or not it will come to Thailand.The military industry index has lagged behind the market for a long time: In 2016 and 2017, the Shenwan Military Index rose 24th and 25th among all industries respectively, and ranked close to the bottom for two consecutive years. The continuous downturn in the market makes the industry, whether it is a fundamental indicator or an institutional allocation indicator, all at historically low levels: From the perspective of the valuation of the industry itself, the current market rate of the military industry is around 2.8 times, which is in the top 15 of the industry's historical performance. %, belonging to the low; from the perspective of institutional configuration, the end of 2017, the ratio of public funds to the military industry is 1.8%, the lowest point in the past decade. By tracing the historical performance of the industry, we can see that the military industry is a highly flexible industry. When it ranks the bottom two for two consecutive years (the last five), the performance of the third year must enter the top 3 of the entire industry and achieve a counter-attack. In 2018, with the major improvement in the fundamentals of the military industry, the military industry index is also expected to achieve a new round of counterattacks. Then, in 2018, what branches of the military industry will perform better? We believe that military enterprises that can embody the advantages of core equipment will have better performance. After substantial investment in equipment costs, orders for core equipment that can “complement the short board” will increase significantly. The performance of competitive companies such as naval vessels, air force fighters, and navigation and communications will be significantly improved. The CBOE volatility index fell this week.This week the Chicago Board Options Exchange (CBOE) Volatility Index (VIX, commonly known as the Panic Index) fell. As of April 13, the index fell to 17.41, a decrease of 18.89% from last Friday. Compared with the previous week, market risk aversion eased, indicating that the market's recent decline in panic has declined. The A-share Shanghai Composite Index rose this week.This week, the Shanghai Composite Index rose slightly to close at 3,159.05. The Shenzhen Composite Index and the SME Composite Index also rose. The KLCI was slightly lower. This week's steel performance is better. At the close of trading on Friday, the Shanghai Composite Index closed at 3,159.05 points, and the weekly gain was 0.89%. The Shenzhen Component Index closed at 10,687.02 points, and the weekly gain was 0.02%; the SME Composite Index closed at 10,850.86 points, a 0.23% week-on-week increase; It closed at 1824.59 points, with a weekly decrease of 0.67%. The turnover rate fell this week.The turnover rate has dropped this week. As of April 13th, the turnover rate of A shares was 0.67%, and the weekly decline rate was 14.91%. The market risk appetite decreased compared to last week. Open market operations are net withdrawals.This week, the total amount of reverse repurchases will be RMB 20 billion, the amount of reverse repurchase will be RMB 110 billion, and the net cash withdrawal will be RMB 90 billion. The weighted interest rate for interbank pledged buybacks declined.This week, the interbank 1-day pledged repo rate rose from 2.3955% on April 8 to 2.5910%, or 8.16%; the 7-day pledged repo rate rose from 2.7396% on April 8 to 2.8922%, or 1.91%. %. The weighted interest rate for interbank repo pledges for seven days has increased slightly. In the short-term, there is a possibility of tighter funds as a whole. The discounted bill rate has declined.Last week, the bill discount rate fell. The PRD bill direct interest rate (monthly interest rate) fell to 4.30 ‰, the long straight interest rate of the Yangtze River Delta Notes (monthly interest rate) fell to 4.25 ‰, the mid-west bill discounted interest rate (monthly interest rate) fell to 4.35 ‰, and the discount rate of the Bohai Rim bill ( The monthly interest rate fell to 4.50‰, the trend of the capitalization of the bills declined, and the operating costs of corporate financing decreased. The yield on 10-year Treasury bonds rose, and the yield on 1-year Treasury bonds fell. This week's long-term interest rate spreads have increased.This week, the yield on 10-year Treasury bonds rose, and the yield on 1-year Treasury bonds fell. This week's long-term and short-term interest spreads increased, eventually ending with 0.5049%. This Friday, the one-year Treasury yield and the 10-year Treasury yield were 3.2013% and 3.7626%, respectively. The difference between the yield of one-year Treasury bonds and the yield of 10-year Treasury bonds increased from 0.4643% on Friday to 0.5049. %. The short-term interest margin has increased slightly, and the contradiction between the supply and demand of funds has slightly decreased. As of this Friday, the balance of financing in Shanghai and Shenzhen increased.This week, the balance of financing of the two cities increased and increased from the previous week. This Friday, the balance of financing of the two cities was RMB 960.030 billion. 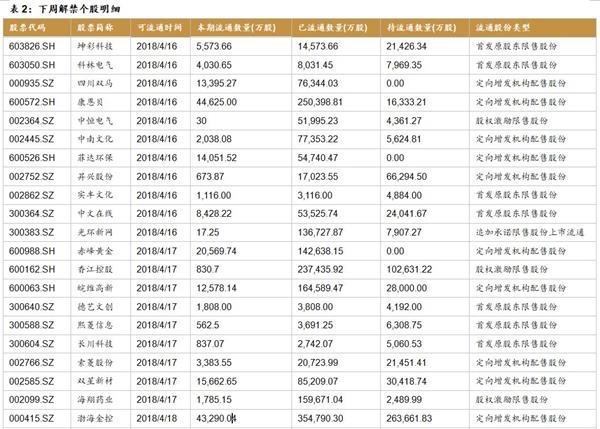 The balance of financing of the two cities rose from RMB 9,928.13 billion on April 4 to RMB 964.030 billion, an increase of 0.32%, and the market activity increased. This week, the funds in all sectors showed a net outflow.This week, the funds in all sectors showed a net outflow. This week, the motherboard's total net outflow was 54.852 billion yuan, up 12.02% from the previous week. The small and medium-sized boards had a net outflow of 100 million yuan, down 23.05% from the previous week. The cumulative net outflow of the GEM was 25.268 billion yuan, down 12.40% from the previous week. The net outflow of industry funds increased.Of the 28 first-tier industries this week, only the banks had net inflows of funds, and the net inflows were 1.284 billion. The three industries with the largest outflow of funds were medical biology, electronics, and computers, with net outflows of 10.566 billion yuan, 9.072 billion yuan, and 7.558 billion yuan respectively. The pressure to lift the ban will increase next week.As of April 15 this week, the market value of A shares lifted was 33.109 billion yuan, a decrease of 20.38% compared with the previous week, and the pressure to lift the ban was falling. Among the types of lifted bans, the initial shareholder had the highest percentage of shares with restricted sales, and the market value for the lifted ban was 53.52% of the market value of all lifted bans. The lifting of ban pressure will increase next week, and the market value of lifted bans for all A-shares will be 39.492 billion yuan, an increase of 19.28% from this week. . The secret of precision traders is here Jedi rebound? Capital flow reveals the main action Must see! This stocks are turning over! GEM fell by 2% Unicorn Funds Strike! Daily fund full sale! With support at around 3100 today, I estimate that the market can temporarily stabilize and rebound. If the rebound cannot be returned to above 3160 points, if it does not, the trend will be very dangerous. Space development will not rise before the increase! State-owned central enterprises generally do not reduce their holdings! Military: Ten Department of Aerospace Science and Technology! Inject missile launch assets expected, vehicle networking, sensors, industrial Internet, aerospace three homes the only listed platform, Beidou navigation, aerospace science and technology 000901 will send high? 31 yuan broke through 38%! Jesse technology, military 5G, big power Tiantian FAST, increase the price of 30 yuan break 40%! Since ancient times, Niugu shares! The next Jiulian development? The reform of state-owned enterprises pioneered the development of long-term cooperation to inject Poly military? The price-earnings ratio is only 24 times the 32 East China Computer, will it be a total of seven listed platforms? “Currently, China Electronics has established the China National Electric Instrument and Instrument Co., Ltd. (“CLP Instruments”) with 40 centers and 41 centers as its core, and established China as the core with 30 and 33 centers. Electronic Technology Network Information Security Co., Ltd. (abbreviated as "China Net Security"), has established seven companies, thirty-four, thirty-nine, fifty, fifty-four, etc. The Communications Division established the Zhongdian Science and Technology Group Chongqing Acoustic Optoelectronics Co., Ltd. with 24, 26, and 44 centers as cores. The joint ten, twenty, forty-one, fifty Four, twenty-eight, fourteen, and thirty-two were jointly established with Sichuan Province and Chengdu City by CEC Aviation Electronics Co., Ltd. (abbreviated as “CNA”), established by relying on 58 Kexin IC Co., Ltd. etc." Why does the vastness rise? The train of thought is correct. A strong army can establish itself. The Belt and Road also needs strong military power to guarantee! 300593 military plus 5G, the recent acquisition of Wuhan Yongli, has now become the overlord of military communications power! Why does the military always go up a bit? Is it that institutional funds are smashed by retail investors? What will be the same historical high as the Baima stock when it is bought in 15 years? Go, expert recommendation will fall! In a weak market, the military and industrial stocks countries are not saving. China will really be finished. To save the market, we must first save the military and pull the military to drive the broader market. Is the expert wanting us to pull individual military personnel? The military sector is a scarce resource in the market. It is not even related to the issuance of new shares. It has never been worse than any sector.